Clear Hardcoat lens with adjustable temple. Gives better coverage and higher protection. 3M Safety Goggle, 1709IN Plus is a premium quality Safety Goggles from 3M. Moglix is a well-known ecommerce platform for qualitative range of Safety Goggles. All 3M Safety Goggle, 1709IN Plus are manufactured by using quality assured material and advanced techniques, which make them up to the standard in this highly challenging field. The materials utilized to manufacture 3M Safety Goggle, 1709IN Plus, are sourced from the most reliable and official Safety Goggles vendors, chosen after performing detailed market surveys. Thus, 3M products are widely acknowledged in the market for their high quality. 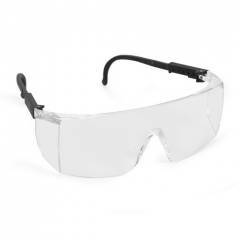 We are dedicatedly involved in providing an excellent quality array of 3M Safety Goggles. Purchased 3m safety glasses from moglix at remarkable price, perfect safety goggles.it is very comfortable, light weight. Superb quality glasses and frame stick is very good. As per my experience I will buy from here very soon. Purcahsed 3m safety glasses from moblix at remarkable price, perfect safety goggles.it is very comfortable, light weight. Superb quality glasses and frame stick is very good. As per my experience I will buy from here very soon. Amazing collection of all type of safety products at moglix store. Ordered a 3M safety goggles from here. Superbly designed glasses with hard coated polycarbonate lens, very loght and contemporary style. Very Impressed with the timely delivery and packaging. Moglix is best online store with best service at economical prices and excellent support team.